Summer 2019 Internship Applications Now Closed! Will reopen for the Fall semester in June! 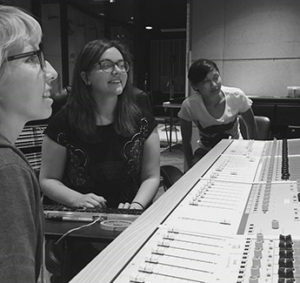 Women’s Audio Mission’s Internship Program is widely recognized in the audio and music production industries for the caliber of training, range of activities, overall experience, as well as job placement opportunities. Past interns have gone on to positions with such companies as Dolby, Pixar, Apple, Sony, and Pandora, as well as most of the premier venues for music and performance in the San Francisco Bay Area. In addition to core responsibilities, WAM interns also take advantage of special tours of our partners’ labs and spaces (e.g., Dolby, Meyer Sound, Arup, and Facebook), behind-the-scenes access to sound checks for major acts (e.g., Janelle Monáe, Sheila E., St. Beauty), private professional development opportunities with industry leaders, and much more. WAM’s Internship Program is open to women (transgender or cisgender; non-binary and gender non-conforming individuals are welcome). Women’s Audio Mission (WAM) selects interns three times per year, in the spring, summer, and fall. Approximately 5-10 interns are selected each term through a competitive pool of applicants from around the world.